Lumine Golf & Beach Club is a must play destination for anyone enjoying a golf break in sunny Costa Dorada. Lumine boasts two outstanding championship courses, including one designed by Greg ‘The Shark’ Norman. Both The Lakes and The Hills courses offer very different yet equally enjoyable challenges to golfers of all abilities. Located in the heart of Costa Dorada, Lumine is set in a spectacular location, where golfers enjoy championship golf while gazing over Roman ruins, pine forest, olive groves and the shimmering Balearic Sea. Although the Hills is ranked in Spain’s top 40, both courses host the European Tour's Final Stage Qualifying School, as one of the best 36-hole layouts around. As its name would suggest The Lakes Course winds its way around the Sèquia Major wetlands so accuracy is key throughout the round in order to avoid a nasty penalty or two. Measuring 6,889 yards from the back tees, The Lakes Course is more than long enough to test the best players in the game and thanks to the intelligent layout and the ever present threat of the lurking water hazards it is also the most technically difficult courses of the three. As with all of the courses at Lumine, The Lakes Course is always in superb condition meaning that if you manage the course well and hit greens in regulation you should be rewarded with good birdie chances. In contrast to The Lakes Course, The Hills Course has been carved through areas of mature white pine, carob and olive trees and features fewer water hazards meaning accuracy is still the order of the day but for a different reason; hit a wayward tee shot here and you will have a chance at recovery. The course follows the natural lay of the land and thus players will have to negotiate sweeping undulations which can effect club selection. 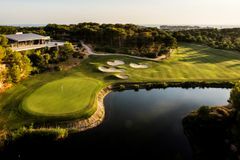 Well positioned bunkers and natural landforms also act as defences for the course and while golfers are enjoying the challenge of battling Old Man Par they will be treated to spectacular views of the Balearic Sea. Measuring 6,926 yards, The Hills Course is more than long enough to keep the bombers entertained while a number of forward tee positions make the course more manageable for players with less prowess from the tee.